Looking for a simple way to take your home’s atmosphere to new levels? Discover the difference classic, beautiful hardwood floors can make in any room. The Floor Trader of Colorado Springs is proud to remain locals’ first choice for elegant hardwood flooring in Colorado Springs, CO, and the surrounding areas, offering products to suit every style and budget. We make it easy to find the solid hardwood flooring you want at sensible prices. Visit our showroom today to get a personalized quote and start exploring products that best suit your next project. Or, go online to browse our digital catalog from the comfort of your home. 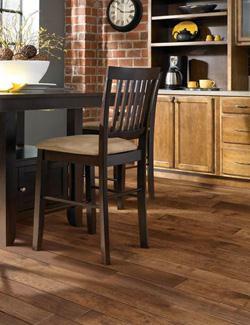 Hardwood’s timeless beauty, durability, and dynamic appearance have made it popular in countries around the world. Shoppers are able to choose from many different types of wood, grain patterns, finishes, and stains. This means that each hardwood floor is highly customizable. As such, you have the freedom to tailor your new floors to your exact preferences. Another perk of hardwood is its dirt, stain, scrape-resistant surface. You’ll be hard-pressed to damage a hardwood floor once it’s been sealed. Additionally, cleaning is as simple as dusting and using an approved hardwood cleaner. When properly cared for, hardwood floors can last generations, adding beauty and character to your home--as well as value, should you ever decide to sell. Hardwood is truly an investment worth making. Enjoy exclusive savings on hardwood that you won’t find anywhere else. In order to pass on the best value to our clients, The Floor Trader of Colorado Springs cooperates with popular manufacturers like Shaw™, Mohawk™, and Armstrong™ to offer quality flooring options at wholesale prices. As a result, you pay a fraction of the cost compared to other retailers. Speak with one of our sales representatives during your next visit to learn about current rates and save even more money. We’re ready to help you plan your next flooring project. When it comes to interior design, options matter. That’s why our showroom carries both engineered and solid hardwood floors. Talk to a member of our team to learn which option is right for you, or check below for additional details. Engineered Hardwood: Composed of a durable core layer, hardwood, and tough coatings, this flooring option delivers all the qualities of classic hardwood at a fraction of the price. Engineered hardwood flooring is well-respected for its durability and ability to resist spills and moisture. Solid Hardwood: Long revered by homeowners and contractors alike, traditional hardwood offers unparalleled longevity and a distinct sense of class. It is a standard in the flooring industry. Add it to your living room, dining room, or bedroom--you’ll love the warm, yet regal affect it will add to your interior. Once you’ve settled on a particular hardwood product, make another great investment by scheduling professional installation services. Hardwood may be beautiful, but the benefits it offers can easily be compromised with a bad installation. Do right by your latest home purchase-- let experienced flooring installers handle the work. This way, you can enjoy your new floors without worrying about installation-related issues down the road. Contact us or visit our showroom to start shopping for new hardwood flooring. We proudly serve families and businesses in Colorado Springs, Colorado, and nearby areas.